The General Assembly has been catching much-deserved criticism for refusing to subject its budget plan to the normal amendment process. That decision is undemocratic and self-defeating, undoubtedly leading to lower-quality policies and unintended negative consequences. But lawmakers deserve to be commended for completing its budget in a timely fashion, providing school districts additional budget planning time to prepare for the upcoming school year. Of course, it’s easy to complete a budget in a timely manner when lawmakers aren’t interested in seriously addressing the funding shortfalls faced by our public schools. Ultimately, 2018’s secretive budget negotiations increased already-planned FY 18-19 public schools budgets by just 0.6 percent. Rather than address persistent funding shortfalls, legislators have allowed another round of tax cuts to move forward, draining state coffers by $900 million. Once again, additional public school funds are mostly directed at increased salary and benefit costs, with little investment that would actually expand school district resources. Of the 24 biggest allotments in FY 08-09, 18 remain below their pre-Recession levels when adjusted for inflation and student growth. For example, funding for textbooks is down 39 percent from pre-Recession levels. Funding for supplies remains 55 percent below pre-Recession levels. And funding for teacher assistants remains 35 percent below pre-Recession levels. Restoring each of these 24 allotments to their highest funding levels would require an additional investment of approximately $994 million. Instead of focusing on restoring budget shortfalls that would provide districts with expanded capacity to address students’ needs, General Assembly leaders instead focused on increasing educator pay. Most notably, their teacher pay plan provides existing teachers with an average raise of 6.5 percent. Of course, not all teachers will receive the average raise. Teachers moving from step 23 to 24 and some teachers whose salaries are being held harmless above the maximum proposed base salary levels ($52,000 for teachers with a bachelor’s degree) would receive no pay increases under this plan. Most experienced teachers would receive pay raises of just $700 (1.36 percent), compared to 7.0 percent under the Governor’s proposed plan. Both the General Assembly and the Governor have proposed increasing principal pay by about $12 million. But the General Assembly continues to tie principal salaries to school performance on standardized tests – a move that has made some talented principals wary to transfer to take on assignments in high-need schools. The schedule can also create large fluctuations in principal pay, as the General Assembly’s hold harmless provision only holds principals above what they received in FY 16-17. The General Assembly’s pay plan leaves behind schools’ most low-paid workers. The much-touted state minimum salary of $31,200 does not apply to public school employees such as teacher assistants or custodial staff. Unlike other state-funded employees, non-certified school employees will only receive raises of 2 percent. Other than teacher and principal pay, the General Assembly has also touted its “school safety” plan. However, the plan is most notable for highlighting the insufficiency of current funding levels. Districts will get $5 million of recurring money to hire more school resource officers in middle and elementary schools (where research indicates they will likely exacerbate racial discrepancies in student discipline). The remaining $23 million is all one-time funding, most of it provided via four different competitive grant programs. 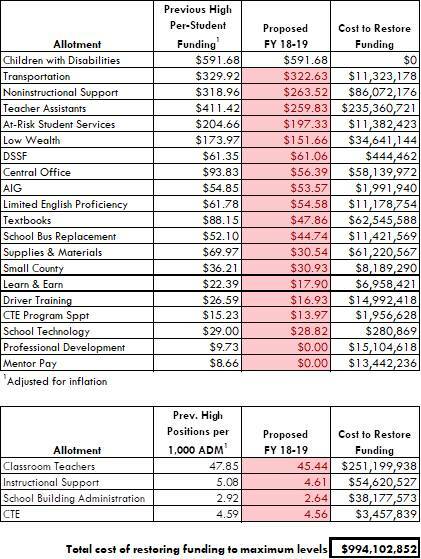 Ultimately, the General Assembly proposes just $10 million of one-time funding for vital, underfunded positions such as nurses, psychologists, and counselors, providing districts with just 132 additional positions for just one year. The scope of the General Assembly’s school safety plan exposes the emptiness of their promise to address the problems of gun violence by increasing investments in mental health supports. Increasing instructional support funding to industry-standard levels would require boosting spending by over $640 million. Yet their FY 18-19 budget proposal would expand funding by just $10 million, and only for one year. The 2018 budget proposal also continues planned cuts for central office ($4 million) and DPI ($5 million). In particular, DPI’s budget cuts will further decimate the agency’s successful District and School Transformation division, hamstringing state efforts to support low-performing school districts. Meanwhile, funding for unaccountable voucher programs will be increased by $13 million. Funding for the Opportunity Scholarship voucher program will increase from $45 million to $55 million, while funding for the Disabilities Grant voucher will increase from $10 million to $13 million. On the positive side, the General Assembly’s budget proposal increases funding for the Needs-Based School Capital Fund by $42 million (though there appears to be no progress on the Public School Building Bond Act and school districts are facing at least $8.1 billion in school capital needs through the 2019-20 school year). Additionally, funding for school technology will be increased – on a nonrecurring basis – from $18 million to nearly $45 million (though funding for textbooks and supplies remains under-funded by at least $123 million). When it comes to special provisions – the policies included with the budget bill – the General Assembly makes several more missteps. First, the General Assembly proposes to extend the state’s failed virtual charter school “pilot” program by an additional four years. These two online schools have been arguably the worst-performing schools in the state. Both schools had the absolute lowest student growth scores in the state in FY 15-16, and both remained in the bottom 1% for student growth in FY 16-17. A second provision would allow city governments to use city revenues on public schools. While that seems innocuous enough, the apparent motivation for the bill is to assist in the passage of HB 514 – the controversial bill that would allow the majority white towns of Matthews and Mint Hill to operate their own charter schools and further segregate Charlotte-Mecklenburg Schools. The language was introduced without input from – let alone the support of – the League of Municipalities. Ultimately, the 2018 budget is another lost opportunity to restore public school funding and meaningfully address the challenges faced by our students. Students who entered kindergarten at the beginning of the Recession in 2009-10 will be entering high school next year. Throughout their academic careers, they have known nothing but austerity budgets. Their textbooks have been outdated, their classrooms lack basic supplies, their school buildings are crumbling, they have never had proper access to mental or physical health services, and their teachers and principals have struggled to hold it all together with minimal support. Yet for at least another year, our General Assembly will continue to neglect this generation’s educational needs. As this budget shows, lawmakers clearly believe another unnecessary round of tax cuts benefiting corporations and wealthy North Carolinians is more important than restoring funding in our public schools. This is not fair to all state workers i am a Custodian I deserve 31,200 also.